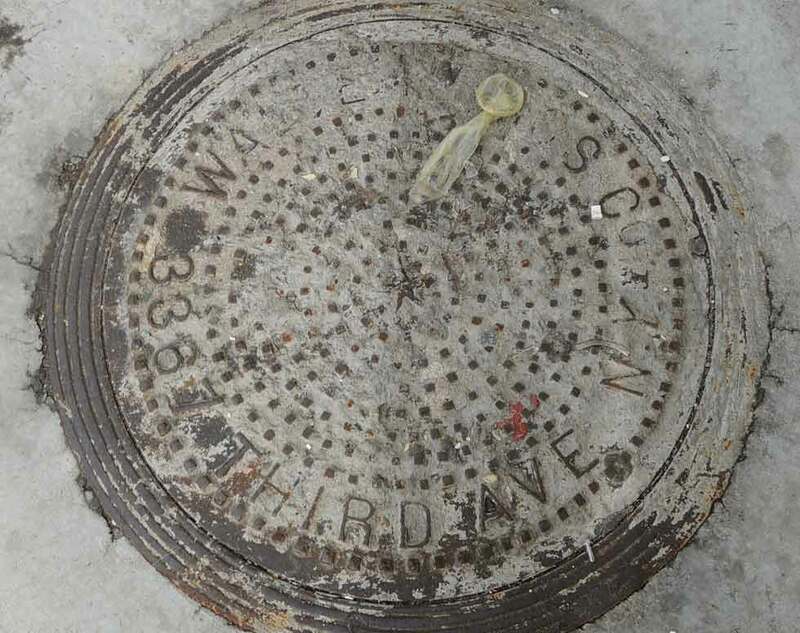 Beneath the discarded condom one can make out Walter Bros., who were hardware dealers in the Bronx, located at 3367 Third Avenue near 166th St. from 1915 to 1970. Initially bakers, the sons of an immigrant baker from Germany, the brothers were Henry Lawrence Walter (1880-1961) and Louis F. Walter, Jr. (1882-1947?). In the 1900 U. S. Census Henry Walter, age 19, was a baker, and Louis Walter, 17, was a bookkeeper. They lived with their father, Louis Walter, a baker, age 43, born Feb. 1857, Germany, immigrated 1872. In the 1905 New York State Census both sons were bakers. The family at this time lived at 320 2nd Ave., Manhattan. In 1910 the elder Louis F. Walter was now retired and sons Henry L. and Louis F. Jr. were "Baker, Crullers." The term Cruller Baker was also used to identify Louis Walter's business in the New York telephone directory from 1906 to 1910. For a short period in the early 1910s the Walter brothers were associated with a stable in the Bronx known as Tremont Stables. The Tremont Stable Co. was located at 4132 Park Ave., the Bronx. This business was listed in city directories from 1910 to 1917. By 1915 the Walters had moved on to their hardware store on 3rd Avenue. Both brothers registered for the World War II draft in 1942. Both were employed at Walter Bros. Co., 3367 3rd Ave., the Bronx. Henry Walter was 62 years old and lived at 790 Riverside Drive in Manhattan. Louis Walter was 60 years old and lived at 2761 University Ave., the Bronx.